For several years now the Minnesota Historical Society has been using an advertising slogan that says “History Matters,” with the phrase appearing on everything, from chocolate bars to postcards, buttons, t-shirts and sweatshirts. (How about putting it on some good Minnesota butter?) Who can argue with the thought that history does matter? It is certainly an improvement on the previous advertising campaign which said: “History is soooo fun!” Doing history that really matters is something that anyone who does history wants to do. But, it is only natural that history matters to different people in different ways. And sometimes people can’t agree on what it is about it that matters and how one should express the matter-reality of it. Whether or not I agree with all of what Waziyatawin has to say, it seems to me that it is worth discussing. I am a strong supporter of the Historical Society as a public institution (it did publish a book and a few other things I wrote), but I also have strong differences with the current management of this institution and the various “master narratives” it endorses (whatever they may be). Angela and I are not the only ones who have concerns about this. And it does seem awfully ironic as Waziyatawin points out that “when Autumn was 8, she played the role of her great-great-great grandmother, Maza Okiye Win, to represent one of the Dakota perspectives for the MN Territory exhibit at the MHS. Now she has been arrested at an MHS event for telling the truth about our ancestors’ experiences.” And what of the irony of arresting someone, at History Matters Day at the Capitol, who really does believe that history matters? Han Mitakuyapi. I have pasted below a statement about the events at the state capitol on Monday as well as an “Open Letter to Nina Archabal.” As many of you already know, Autumn was arrested Monday for expressing corrective truths to the crowd during the MHS’s celebration of colonialism. Here is a link to the arrest: http://www.youtube.com/watch?v=RYU8lHKPOXE. Capitol security guards also attempted to yank the camera off my son Sage’s neck (he’s only 11) and I had to physically grab the officer by the chest to pull him away. They clearly did not want a record of her arrest. Ironically, when Autumn was 8, she played the role of her great-great-great grandmother, Maza Okiye Win, to represent one of the Dakota perspectives for the MN Territory exhibit at the MHS. Now she has been arrested at an MHS event for telling the truth about our ancestors’ experiences. Waziyatawin, Ph.D.
On Monday, February 16, the Minnesota Historical Society (MHS) once again demonstrated its disregard for Dakota humanity and its willingness to uphold its racist and colonialist heritage, a heritage that harkens back to the institution’s founding by the imperial fathers of the State of Minnesota such as Alexander Ramsey. During their “Day at the Capitol,” opportunely falling upon President’s Day, the MHS used their time at the capitol to celebrate U.S. Presidents while paying special homage to Abraham Lincoln with a bicentennial salute. Replete with the rhetoric of manifest destiny ideology, a Lincoln impersonator reciting the Gettysburg Address, the First Minnesota regiment re-enactors playing Custer’s song, and even children making and donning construction paper stove-pipe hats, it was an absurd event, albeit a recurring one. Dakota spectators and our allies felt like we stepped into a familiar colonial drama. Given the fact that Lincoln’s most spectacular legacy in the state of Minnesota is the largest, mass, simultaneous hanging from one gallows in world history, he is better known here as the Great Executioner rather than the Great Emancipator. Our 38 Dakota warriors lynched in Mankato on December 26, 1862 are not merely a blemish on Lincoln’s otherwise unblemished career (as one of the politicians suggested), nor is it evidence of the “complexity” of the man (as Nina Archabal, the MHS Director stated). 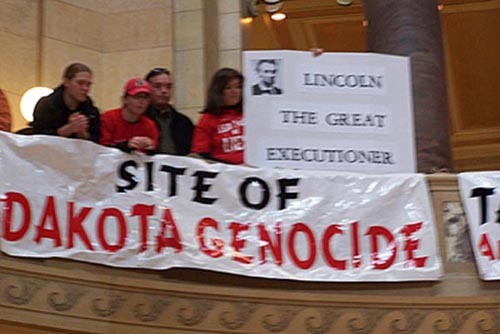 Rather, his hanging of Dakota warriors in this record-breaking and record-setting heinous crime against humanity, can best be seen as a logical outcome of Lincoln’s previous interactions with or policies regarding Indigenous populations. He began his adulthood as an Indian fighter during Black Hawk’s War, as a presidential candidate that ran on a “free soil” platform (the “free soil” to be stolen from Indigenous populations), and as part of an administration that passed the Homestead Act and the railroad acts (which opened the way for massive flooding of white and black populations onto Indigenous lands and land theft from Indigenous Peoples). Further, the Lincoln administration routinely violated the terms of U.S. treaties with Indigenous populations and regularly withheld annuities, pushing Indigenous Peoples, including the Dakota, into starvation and war. Thus, the mass hanging of Dakota patriots was no blemish or uncharacteristic blip in Lincoln’s career, it was simply par for his colonial course. Dakota people and our allies showed up to contest this colonial representation and to raise the critical consciousness of participants and spectators, or at least make those who continue to organize such events uncomfortable. We hung two large banners over the second story rail (“Take Down the Fort: Icon of American Imperialism” and “Site of Dakota Genocide”) and we had a large sign with Lincoln’s picture that read “The Great Executioner.” While several of us were yelling corrective truths to the crowd, Wicanhpi Iyotan Win was targeted by security, arrested and held in Ramsey county jail (an appropriately named oppressive, colonial institution) for about eight hours. She was charged with disorderly conduct. Like other familiar colonial dramas, no matter how offensive are the words and actions of the colonizers, Indigenous people are the ones criminalized by colonial society. In this instance, free speech was granted Wasicu people in the capitol rotunda, but our truth-telling was labeled a crime. 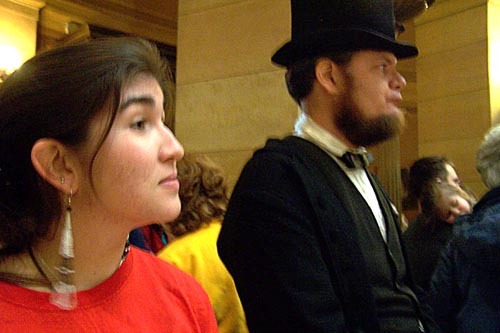 On February 16, 2009 I attended the Minnesota Historical Society’s “Day at the Capitol” where, once again, I was astounded by the institution’s total lack of critical engagement with historical figures, ideas, and events. Instead, the MHS continues to present a simplistic and myth-laden history of great, white, male leaders, characteristic of 1950s elementary school textbooks and construction-paper social studies projects. More importantly, the historical interpretations the institution continues to promote are ones laden with imperialistic manifest destiny ideology and racist assumptions. Perhaps you believe that in persisting with such anti-Indigenous projects you will convince the critical thinkers among us that Indigenous Peoples were indeed savages who did not know how to properly exploit the land and that the processes of invasion, conquest, and colonization and the policies of extermination and ethnic cleansing were necessary, inevitable, and righteous because the proud civilization that has replaced us in our homeland represents the pinnacle of progress and enlightened consciousness. In fact, you would have to believe these myths to promote the level of historical education evident in the absurd event at the capitol on President’s Day. But, you could not be more wrong. Just as there have always been Dakota people who have contested the theft or our homelands and the killing of our people, as long as some of us continue to breathe we will continue to use our voices and our bodies to contest those who would justify the violence against our people, lands, and ways of life. We will continue to be present to attest to the tremendous losses we have suffered so that the invading population could occupy, exploit, and desecrate our beloved lands and to call attention to the ongoing injustices we suffer. Your belligerence in perpetuating colonialist ideology does not serve to silence those of us with the critical eyes who see what you are doing, it only serves to radicalize increasing numbers of our youth and rally support from non-Dakota allies who want to distance themselves from your brand of racism. Under your leadership, the MHS has only entrenched itself as a colonialist institution and guardian of the master narrative in American history. Rather than launching an era of reparative justice with Minnesota’s Original People, your administration has continued the anti-Dakota sentiment and antagonistic relationship with which it began. From the time it first displayed Little Crow’s bounty scalp to its most recent celebration of the Great Executioner, it seems the institution does not miss a chance to attack our people. On your watch, you have only served to alienate and anger each new generation. Before I left the event at the capitol, I congratulated you on once again assaulting the humanity of Dakota people and upholding the racist and colonial legacy of your institution. You said, “Thank you,” and I told you I knew you would take that as a compliment. Your anti-Dakota positioning and colonialist sentiments could not have been more clearly expressed. It has been less than a 150 years. We’re living in the land where the events took place. The memories of genocide are fresh.